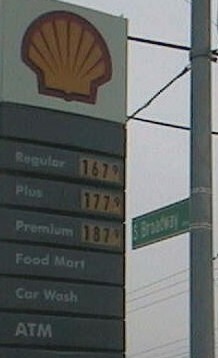 In the past year I have met a few people who never look at gas prices. They just pull into the nearest gas station whenever their cars need gas, and they pay whatever the computers tell them to pay. I couldn't imagine having a mindset like that. I always watch gas prices, and I know which parts of Lexington typically have better prices than the others. Sure, it's a sickness, but I do save a good chunk of change over the course of a car's lifetime, change that I can waste on speeding tickets and towing fees. Hey, in addition to the outrageous gas prices today, I have other news: my friend Robert Shaver has given me a subdomain on his webserver: bugle.robertshaver.com. Now there are four addresses which forward to my page; the other three are bugle.ipfox.com, bugle.3LX.com, and surf.to/bugle/.